There are some dishes that just get better after they sit overnight, and to me, this is one of those. My husband ate two servings the first day though, so apparently he liked it right away. 🙂 This makes a great side dish for five to six people, or could be a light main course for four. Just throw some grilled chicken on top, and you’ve got a full meal. Easy peasy! 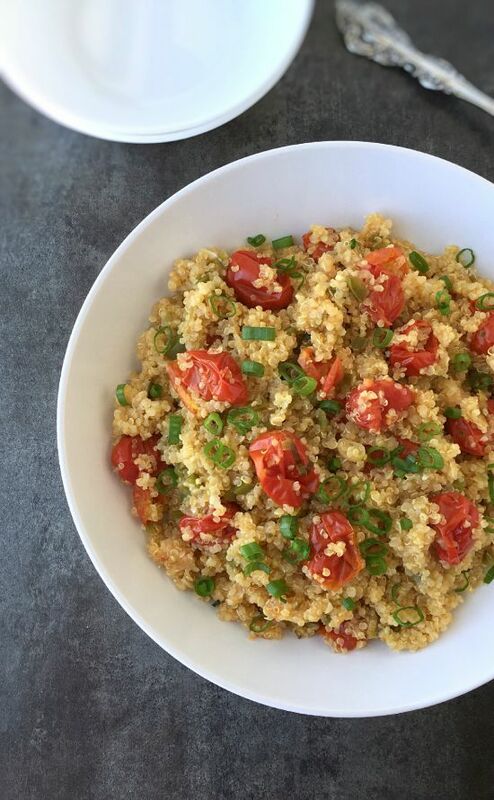 This Tomato and Jalapeno Quinoa features sweet and tangy flavors with just a bit of heat from the jalapenos. I included all of the seeds and ribs of the jalapeno in this recipe, and it really wasn’t all that spicy to me. Of course, the heat level of peppers can vary greatly. 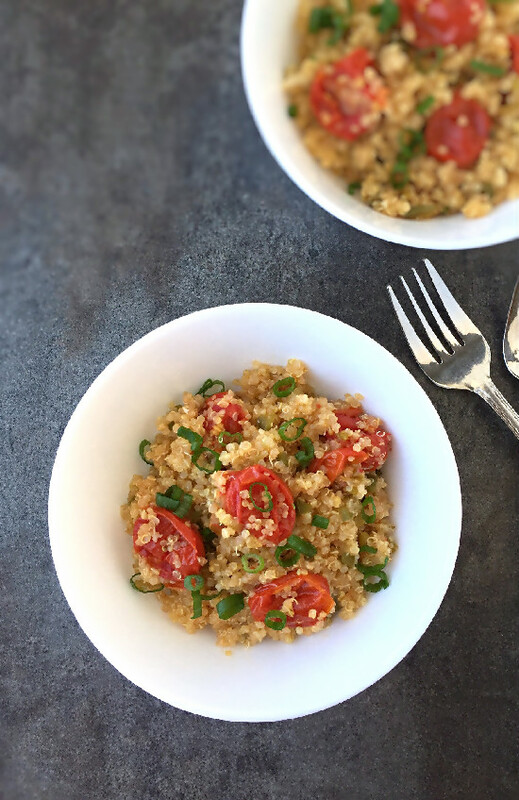 One of my favorite parts of this dish would have to be the grape tomatoes that burst while cooking in the quinoa and get all delicious at the same time. Hard to say which way I like these little tomatoes more. Fresh in salads or cooked just like this. It should be rinsed prior to cooking because the natural coating on it, called saponin, can make it taste soapy or bitter. 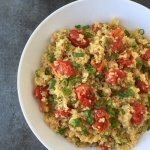 If you’ve had quinoa, and thought it tasted bitter, this was probably the reason. Just place the quinoa into a mesh strainer and give it a good rinse before cooking. *You can buy pre-rinsed quinoa, but it usually costs more. Fun Facts: Quinoa is actually a seed, not a grain. However, it can be used like a grain in a variety of different dishes. It has a nutty flavor and is high in magnesium, fiber and iron. Oh yeah, and it’s also deliciously good! In 10 inch skillet (that has a lid), Heat the olive oil over medium-high heat. Place the grape tomatoes in the pan and saute until softened, about 5 minutes. Add the jalapenos and cook until they begin to soften, about 2-3 minutes. Lower the heat to medium-low, add the garlic and scallion whites and cook for a minute more. Add the water, quinoa, and sea salt and bring to a boil over medium heat. Reduce the heat to low, cover and let simmer until the quinoa has absorbed all of the water, about 15-20 minutes. Remove from heat and let stand, covered, for 5 minutes. In a small bowl, mix together the honey and white balsamic vinegar. Fluff the quinoa gently with a fork. Pour the dressing over the quinoa, add the green parts of the scallions, toss to combine, then serve.